That makes me feel way better! 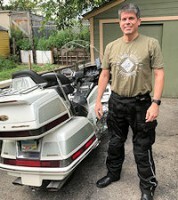 By the way (and considerably off topic), I enjoyed this month's newsletter and the pictures/videos of the GoldWing meetup a few weeks back--that was nice reading this morning. Looks like these are out of stock on Amazon. I ordered mine directly from Electrical Connection. Got it in two days. I just ordered mine. Thanks so much Scott! Yep, that's the one. Installation was a breeze, but I did need to make one modification. On my GL1100, the back of the headlight alcove is closed, affording no room for the heat sink. However, my Harbor Freight multipurpose tool (a must have for any DIYer) made short work of that--I cut a square patch out at the very back of the alcove that allowed ample room for the heat sink and wiring. Other than that slight modification, as well as a little creative work to find a way to secure the connection block (thank you to whomever invented zip ties! ), and it was done. The whole job took less than an hour. 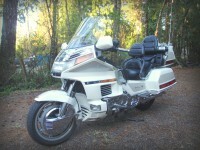 And how does it look on the GL1100? Noticeable improvement? Heck yeah! Like night and day. Intensely bright white light—very visible. Well, it turns out, like I try to convince my wife..some of the only times I make a mistake is when I think I did. Had forgotten that I installed shims with the last set of H4s that I replaced. Oh well, when I receive the 2 sets that ordered from Cyclemax, I really will have extras! Been there and done that, too many times to count. Scott, so where did you end up wiring tying it to? I believe it was tied to the wiring bundle right next to the front of the triple tree, that runs down from the handlebars. If I remember correctly. Okay, I have the light assembly loosely bolted in and it looks like the left on that has to cross over to get to the cutout really shouldn't be an issue, since it has no cord left to go anywhere, but I see how the right one could be an issue if just left dangling. I thing I'll grab some of that double-stick tape you recommended and do what I can with the one-handed fish around to find where to wire tie too. Thanks. I feel I should post an update to this review, although it doesn't have anything to do directly with the performance of the product. As I stated in the original review, I selected this LED because the last time I used the SoCalMotoGear headlight to review. I purchased this LED myself (as I do with most review items) and wrote the review based on that purchased LED. After I posted the initial review, I received a private message from Lewis, the owner of Electrical Connection, offering a free set of LED headlights to use as our monthly prize. I took him up on his offer, and that became September's prize. 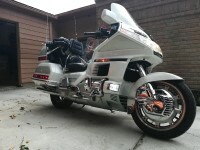 After the September prize drawing, I sent an email to Lewis sending him the winner's name and address, and the type of Goldwing he needed LEDs for. I sent him a PM through the site. I sent another email. I called and left a voice mail. After six weeks of attempting to contact Lewis at Electrical Connection and getting no response, I have no other choice but to assume he is not going to fulfill his offer. 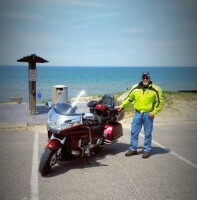 I went to Cyclemax and purchased a set of EC LED headlights and shipped them to the September contest winner. So...the headlights are performing very well, and I'm still quite pleased with them. But as you may have read, the SoCalMotoGear second generation Pathfinder LEDs work just as well, and are superior in a couple ways. If company reputation and the ability to stand behind a promise mean something to you, you may want to take my experience into consideration. Scott, you’ve really gone “above and beyond the call of duty”! It really is a shame when someone promises something and puts you in a difficult situation by not doing what they promised. To purchase a set to give away for the contest, out of your own pocket, shows your unflagging dedication to your forum friends, your selflessness, and your sense of fairness. I, for one, salute you, sir, as I’m certain all the good members of this forum do. That is a real shame Lewis didn't respond. I might be sticking my nose in where it doesn't belong, but I just called EC and spoke to the guy that answered the phone. He said they have been out of LEDs for about 6 weeks and they just came in. I told him about the situation and expressed my concern for Lewis not responding to Scott. He said, "I understand and I am texting Lewis about this RIGHT NOW". I gave him the website info and my contact information. Hope it helps.